A recent visit to Cafe and chocolate shop Four Friends in Sydney's Crows Nest provided the first real outing for us as a family since William was born. The name Four Friends comes from a Buddhist story about interdependence, where four creatures - a bird, a rabbit, a monkey and an elephant work harmoniously together towards the benefit of all. The story reveals the idea that everyone should show love and respect to one another despite their differences. 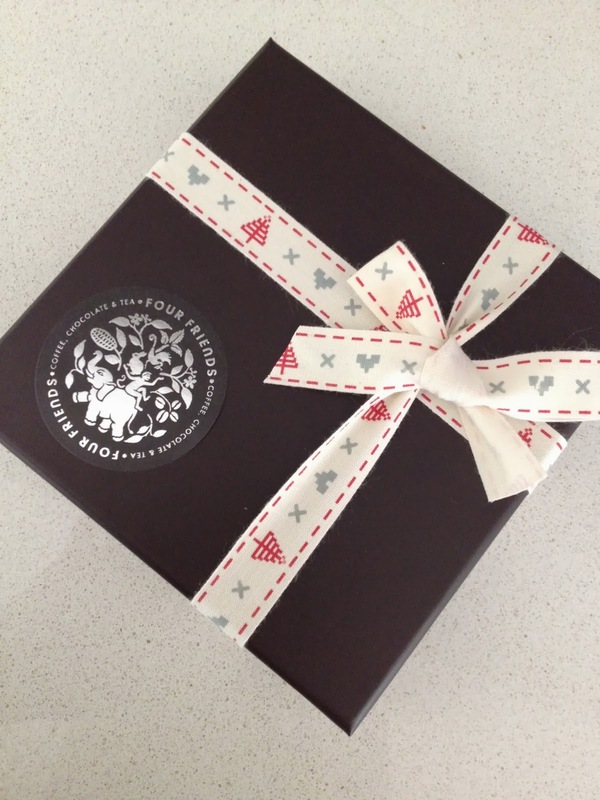 Four Friends prides itself on creating bespoke treats that are good for us and better for the planet. I love the fact that their chocolate and macaroons are made free from any preservatives or artificial sweeteners. Using the finest organic and fair trade cacao from Belgium, and other organic ingredients, owner Katze Ting hopes to help educate consumers about the real taste of natural organic ingredients. 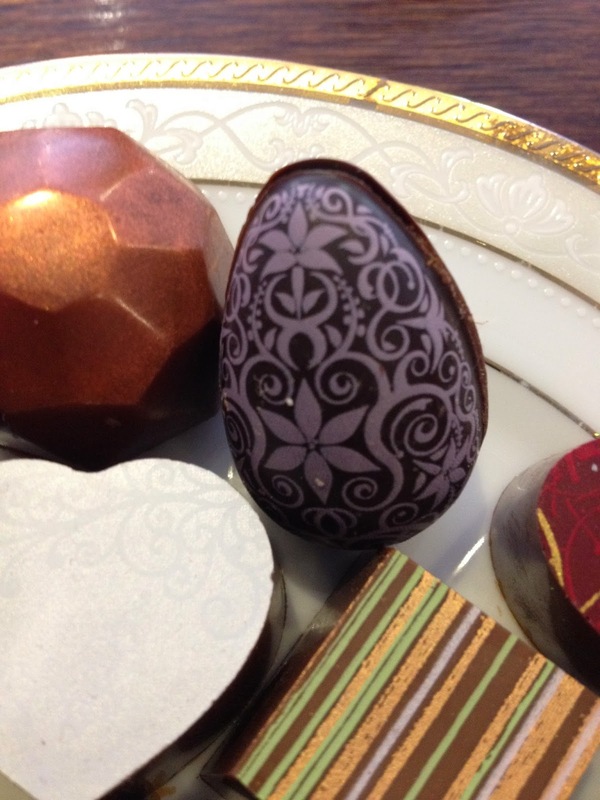 Delicious chocolate flavours include chilli chocolate, earl grey, peanut butter, salted caramel, popping candy, hot cross bun, bubble gum vanilla,green tea, marzipan, caramel and almond praline. In addition to the delicious chocolates, Four Friends also offers guests a sustainable menu which includes savoury pancakes, waffles, frittatas, croissants and cakes, all made using local and organic ingredients. Coffee is good and tea enthusiasts will be impressed with over 40 organic teas from around the world to choose from. I can highly recommend the berry fairy blend which was creamy on the palate and bursting with fresh berry flavours - presented in a gorgeous tea pot and saucer. 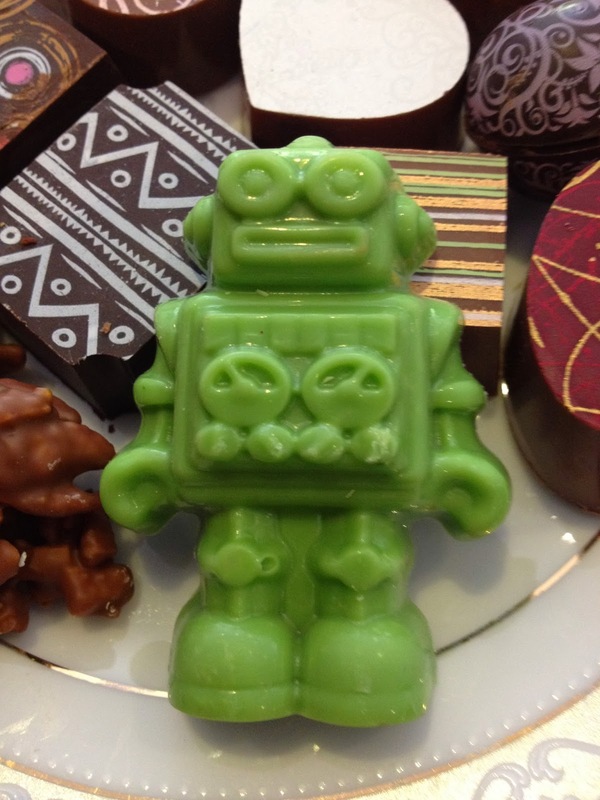 Aww that robot chocolate is so cute! And I love that they have such a huge selection of teas!